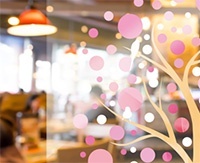 On transparent media, white base layer print enhances color vibrancy of an upper color layer. The three-layer printing (base layer: color, middle layer: white, upper layer: color) enables the creation of window signs that are beautiful from any angle. Furthermore, when the image file is printed only in white, an appearance of printing is very stylish. 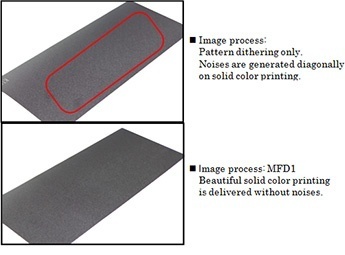 Such printing method broadens an application of white ink printing. 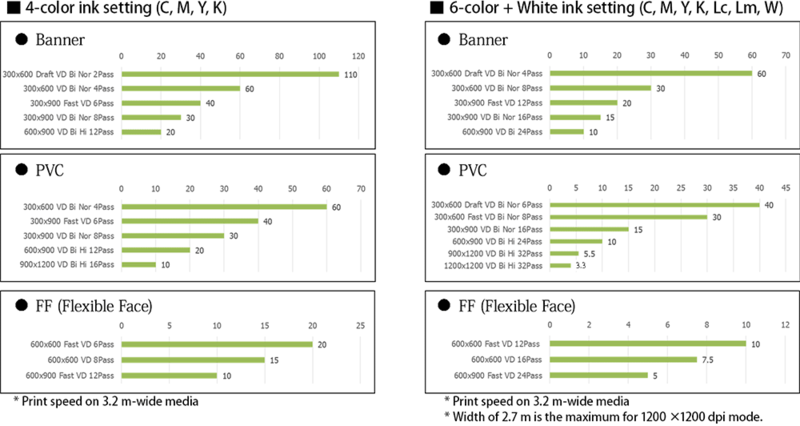 UV-curable inks form thicker ink films compared to other inks such as solvent inks and maintain vibrant colors when using for backlit signage. 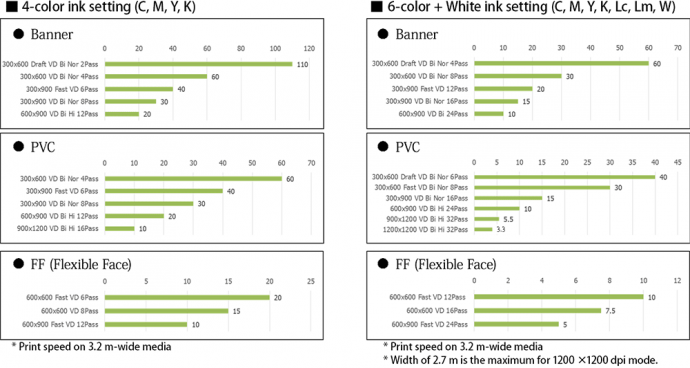 Also, white ink enables three-layer printing (color + white + color). In general, only color UV inks are used for multi-layer printing to increase the degree of opacity but the print appears dark on the sign-board during the day, when internal illuminations are off. UJV55-320 enables beautiful coloring reproduction during both day and night by introducing a white layer in the three-layer printing. This allows the design of beautiful backlit signage that can be adjusted according to application, location, and graphic design file. Built-in LED light is useful for checking the print appearance on the backlit signage before taking up the print. This capability minimizes waste media because an operator can stop printing immediately when misprint or other problems are found. Furthermore, the productivity is also increased by printing and performing a print quality check simultaneously. 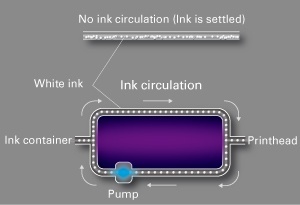 UV-curable inks are instantaneously cured by UV irradiation; thus, no drying time is needed. The ability to carry out processing and operations immediately after printing shortens the operation time, improves productivity, and helps meet a short delivery time. The new model achieves a printing speed of 60m2/h in high-speed mode on banner material. In order to deliver excellent print results and productivity, we provide optimal profiles that meet various media types and print resolutions. 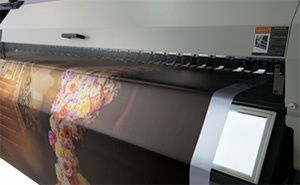 Taking advantage of the 3,200 mm printing width, two media rolls can be mounted and can be printed on simultaneously*. This function enables operating different print jobs at once. The user may select the preferable widths separately for each roll within a specified range from 210 to 1,524 mm. Each media width and the distance between the two media rolls are automatically detected. * The same media type should be used when printing on two media rolls simultaneously. Useful functions are similar to excellent assistants. Clogged nozzles are automatically detected and recovered without causing inconvenience to users. The nozzle check unit (NCU) automatically detects clogged nozzles and operates cleaning; whereas, the Nozzle recovery unit (NRS) uses only good nozzles as substitutes, if the clogged nozzles are not recovered after cleaning. These functions allow constant printing and reduce waste printing due to defective nozzles. If the clogged nozzles are not recovered after cleaning through the NCU function, the NRS selects substitute nozzles and then restarts printing. This is a significant novelty, since previously, when nozzle cleaning fails, the printhead has to be repaired by a technician, and the printing operation ceases until the printhead is repaired. The NRS* allows the printer to continue printing without interruption by using non-defective nozzles as substitutes for defective nozzles until the technician arrives. The newly developed RasterLink6 software, incorporating the patented* image-processing MFD1, reduces noises due to dithering through hybrid processing of pattern- and error-diffusion dithering, thereby enhancing printing quality. Generally, swath boundaries are straight lines. Therefore, a slight misalignment between boundaries causes banding or uneven color printing. In order to reduce such unwanted printing, Mimaki has developed MAPS. The UJV55-320 is the world’s first printer that uses the latest MAPS4 technique, incorporating the most advanced algorithm for spattering boundaries between print swathes. Beautiful quality print outs are produced even in high-speed printing and lengthy printing operations. Each ink color has its own specific gravity and viscosity. To achieve a precise placement of ink droplets onto the media, Mimaki has designed an optimum waveform control technique that allows the printhead to jet each ink color at an optimum angle, maintaining excellent ink droplet circularity. 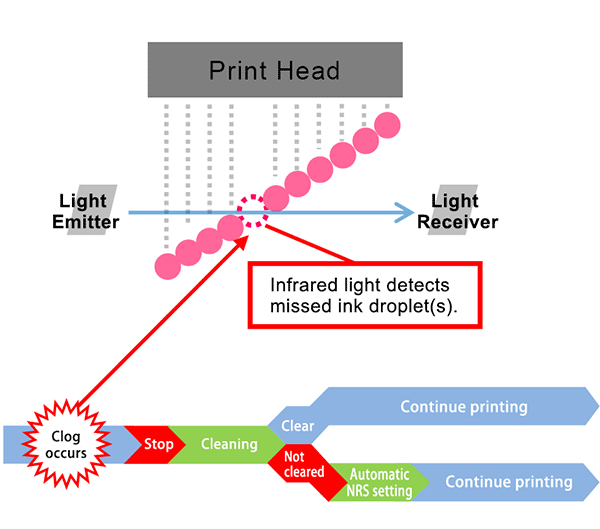 In each printing mode, ink droplet sizes from 7 pl to 36 pl are automatically selected to obtain optimum print results. By attaching the soft-media transportation kit (PN: OPT-J0400) to the UJV55-320/SIJ-320UV printer, it is possible to print on soft media. This has been difficult until now because of the creases that often form when the media moves through the printer. The soft-media transportation kit' s stretch roller and tension bar reduce the occurrence of creases and thereby provide stable movement of media. This enables high-quality printing on soft media such as thin tarpaulin, soft polyvinyl chloride (PVC), polyester banners, and curing sheets.